A baking expedition through mistakes, mishaps and sweet success. Appropriately, this is the mother of all posts. Why? 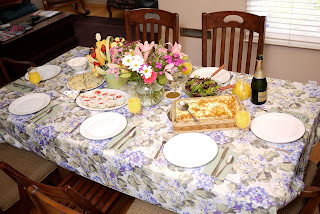 Because we baked not one, not two but three dishes for our Mother's Day Brunch. Now, you've seen us make scones before so we didn't document it. We decided to make these because our Mom really liked the last scones we made and we were already planning on making them when she requested them the day before. We also needed to have a good fall back in case dish #3 didn't work out. More about that later. Lessons learned: Boys like scones too. They came out really well. Also, make scones more often. It was sooo easy the second time around. Our Mom loves raspberries. 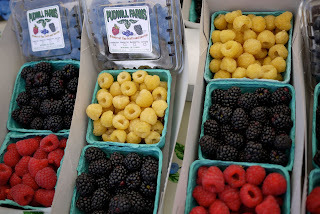 We knew we wanted to make something with them because we have a great source for them at our local farmer's market (and nearly all farmer's markets in the Los Angeles area), Pudwill Farms. 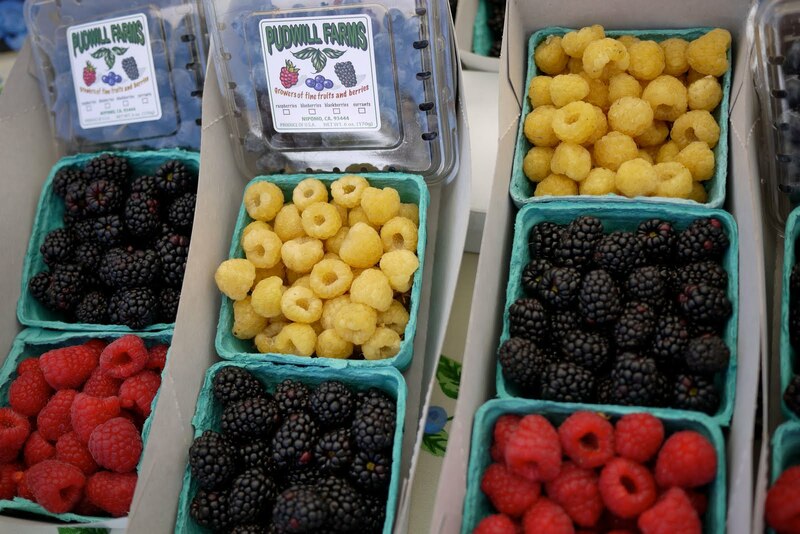 The berries they sell are always sweet, flavorful, fresh and ripe. They cost more than your typical grocery store brand but you're paying for the guaranteed quality in that "They were just picked yesterday!" and won't go bad immediately. Plus our Mom deserves the best. The recipe comes Martha Stewart's Cupcakes book. This is a really great book that she put together. There are a lot of collaborators and fantastic ideas to creat amazing cupcakes. The best thing about it is that it is easy to use and really emphasizes a "Can do" element that we like to promote. The recipe for the big version can be found here. 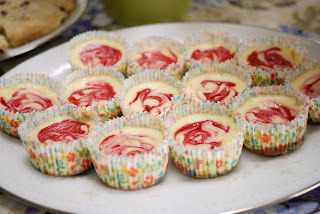 We have experience with Mini cheesecakes. Everybody likes them. We had a little snafu with the oven as while we were preheating; we discovered it wasn't clean. We didn't want to relive the smokey superbowl pudding, so we prepared the graham cracker crust in the toaster oven while we waited for the big oven to cool. Yes, our toaster is big enough to fit a 6-muffin tin. We call it "The Toaster that Ate Chicago." It worked out for the crusts because it took less than 5 minutes a batch but baking all 32 cakes in there would have been ridiculous. So, we cleaned the big oven. Most of the process was easy and fun. 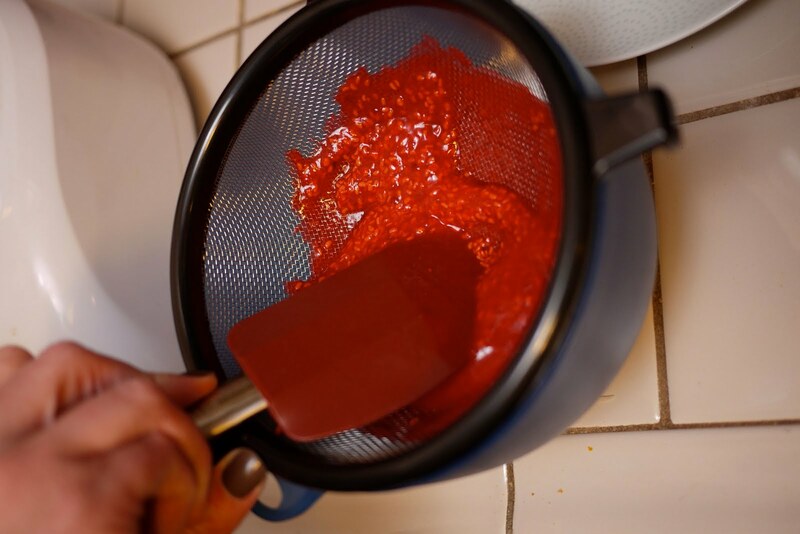 We pureed the raspberries and strained them. 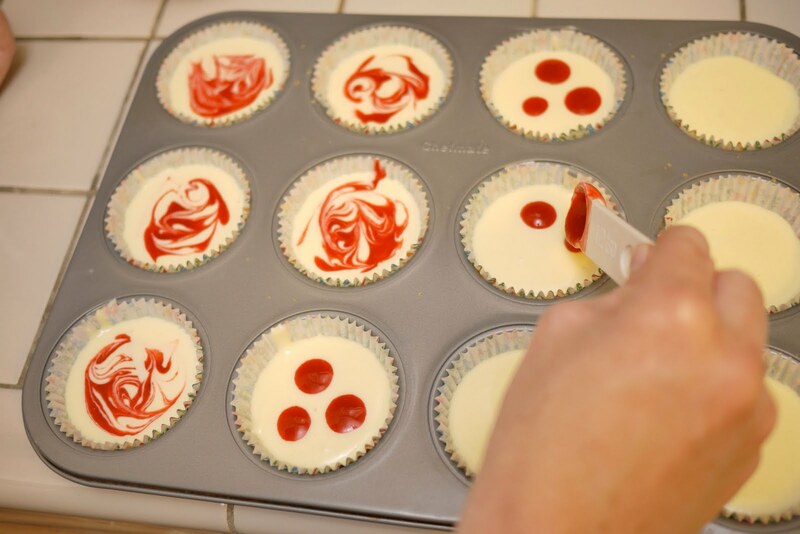 Then we put a tspn of the puree on top of the cakes and swirled it around with a tooth pick. Pretty! This recipe calls for baking them in a water bath; placing the cupcake tin in a pan of hot water in the oven. This is to prevent the surface from cracking and to preserve the delicate creaminess of the cheesecake, but we're not convinced it's entirely necessary. We prepared the first batch in this fashion and found that they took a really long time to cook. This is probably because we took to long to get the cheesecakes into the oven after pouring the water in. By the time it went into the oven, it wasn't even close to hot. This caused the baking time to more than double! Oops! Plus it was a little nerve racking trying to maneuver the tins and not splash the water onto the cakes. We were happy with the cakes. Lessons learned: We would use a little more graham cracker crust and a little more raspberry puree but these are tasty as is. 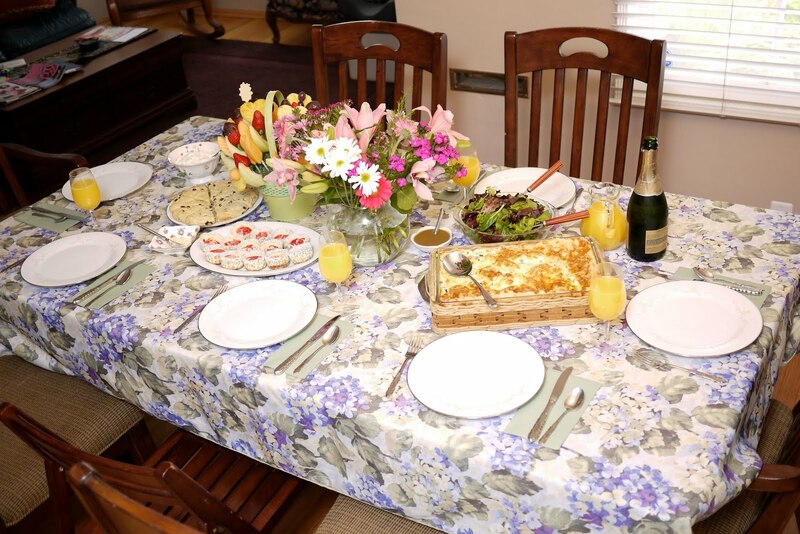 When we tell people about our blog, a lot of the time they say "oh, like 'Julie and Julia'!" I hadn't seen the movie before beginning this but knew the concept. Since we get the comparison a lot, we decided that we should make something from "Mastering the Art of French Cooking." After this experience we think that Julia Child is a great cook, Julie Powell is crazy and admirable for doing that, and we are not inspired to cook any thing more from that book but would rather learn French. I'll explain: we found Mrs. Child's book incredibly hard to use. There is A LOT of information there but we were flipping back and forth to understand how to make the Bechamel Sauce (which I screwed up), or where to add the egg whites (which I screwed up). We understood from the onset that making a souffle is a complicated process but "Mastering the Art of French Cooking" did not help. Just reading it made us more nervous. My favorite part was just reading the recipe names with a French accent: Souffle au Fromage, Souffle aux Epinards, Souffle de Poisson but then we started singing "Les Poisson" from "The Little Mermaid" and got sidetracked. This is the beginning of the Bechamel Sauce. It's easy enough, melted butter, and flour. We heated it up and then added boiling milk. We thought that a Spinach and Leek quiche sounded lovely so we sauteed them up and added them to the sauce. Then there was the egg whites. After our last experience with whipping egg whites, we were trying to be extra careful. We learned from our research with Julia that if there's even the slightest bit of egg yolk in with the whites, they won't whip up properly and we think that's what happened last time. This time, we were really good about separating the egg whites but that is about as far as the success went. Yup, you guessed it. This is a classic example of over whipped egg whites. We are not yet one with our Kitchenaid mixer. Julia says that the way to save this is to add another egg white but we used all the eggs in the accidental yolk wasting so we had no choice but to go with it. Sara immediately noticed that it could be more even but the recipe stressed not over-mixing it so it just went into the oven. It looked pretty great, it tasted pretty great. Isn't it classic Julia Child to say something about acting cool cause only we know what happened in the kitchen? Oh wait, we have a blog, darn! Well, you know it all now but it was still a success. I think we might try it again one day but for now, we'll take our lessons and be happy our Mom enjoyed it for Mother's Day. Lessons learned: All of the egg gets used and we need some practice at whipping egg whites. Leeks are a great way to flavor an egg dish. One more lesson learned...always make sure you have an additional dozen eggs laying around :) Just a thought! Love ya both! Sara: You baked without me?!? Erin: It was only a box mix, it didn't mean anything. Sara: Can we use Pam Baking as air freshener? Sara: Do you realize that we've baked something every week this year? Erin: Well, that's not that impressive, it's only January. Sara: We could keep it up. Erin: We could make a blog. Sara: What does "fluffy" look like?